We come up with a plan to free Harshnag and battle the giants at the entrance to the Eye of the All-Father. Halfred and I crept along the ledges that flanked the massive hallway leading to the main doors of the Eye of the All-Father temple. Though we were 20 feet above ground we weren’t even eye level with the giants who stood around the bound Harshnag. One of them was wearing robes and wielding a staff, and stood chanting before the sealed doors. Harshnag was berating the mage for his folly of trying to enter the temple, and received a massive blow to the head from one of his stone giant captors. As we approached I reached out with my mind, alerting the slightly dazed Harshnag to our presence. His body language changed slightly as he nodded in acknowledgement. He shifted and turned. His hands were bound behind his back by massive chain manacles, which he now rested on the ledge. Right next to me. We knew we had a big battle on our hands this week. So big we didn’t even finish it over our nearly three hour session! Our little group has not been the best at planning our actions around hostile encounters. It’s probably why we end up splitting the party and getting in less than optimal situations. This time, however, we actually spent a good chunk of time planning exactly what we wanted to do. The situation: the entrance to the Eye of the All-Father temple had four giants, a frost wyrmling, and a captured Harshnag. We could see them, but they hadn’t yet noticed us. We had the element of surprise. The plan: Korinn cast invisibility on Halfred and Kazin. We went inside for some careful reconnaissance, with our ultimate plan to free Harshnag to gain his help in this difficult battle. Halfred noticed some large slabs on the ceiling cut away from the rest of the rock. They looked like traps that could come smashing down, but we didn’t see any triggering mechanism. Further inside we saw a Frost Giant Mage attempting to get inside the sealed doors of the temple. Another Frost Giant proudly held Harshnag’s rune axe, while Harshnag knelt with his arms bound in chains, flanked by a pair of Stone Giants. With my Awakened Mind I could get up close to Harshnag and communicate with him without making a sound, and remain invisible. I let him know we were here. He responded by casually placing his manacled hands behind him on the ledge I was standing on. I told Halfred to fly back and tell the others. For once we actually came up with a solid plan. T.I.M. would start by enveloping Harshnag in Silence, so no one would notice Kazin attempting to break open the bolt on the chains. We wouldn’t have much time, so the second Harshnag was free (assuming I could do it), Halfred would cover the area in Fog Cloud, and Korinn would drop a Wall of Fire on the edge, hitting the two stone giants. With my Awakened Mind I made sure Harshnag was fully aware of the plan. I had a bit of fun with the DM as I tried to get Harshnag to feed me information out loud, without revealing that he was really talking to me. The Silence dropped, and I went to work on the bolt. Halfred loosened it with a flask of oil and I pulled out a crowbar. I rolled a natural 20, which loosened it a bit halfway. Harshnag jerked his hands which drew the attention of the nearby Frost Giant. He began calling out Harshnag’s name, but the Silence prevented us from hearing it. Knowing I had to work fast, I kept rolling my +4 STR check with advantage. It still took two more tries as the giant began approaching, but then Harshnag was free and Halfred immediately dropped the Fog Cloud on everyone. The Wall of Fire came up, and Harshnag, having memorized the giant’s location, tackled the giant and began wrestling for control of his runic axe. The fight was on! The Fog Cloud created some mixed results. Ultimately it was vastly worth having as it rendered the Frost Giant Mage mostly useless throughout the battle, though it also made it difficult for our own sorcerers to cast spells. The Stone Giants took some fire damage, but then they crossed the wall and left the Fog Cloud. They hurled their giant rocks, one of them nailing T.I.M. with a nasty crit, doing 51 damage and nearly taking him out in a single blow. Bryseis received the other rock, knocking off half her life bar. That was only two attacks! I backed up and used Fear on both of them, though it only succeeded with the back one. The others were able to land meteors, magic missiles, and arrows into the non-feared giant, downing it before it could get another attack off. The feared giant bolted through the Fog Cloud and into a room beyond. 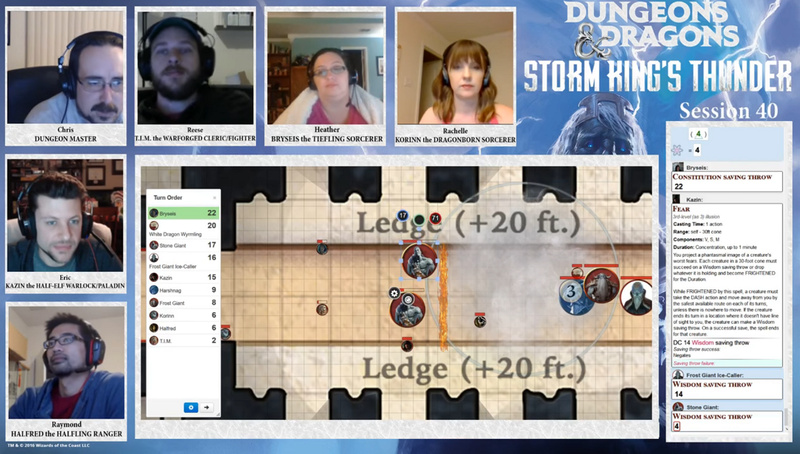 Meanwhile Harshnag was battling the other frost giant and his dragon wyrmling (or so we could see on Roll20, technically it was all in a Fog Cloud). Halfred and Kazin ran inside the fog around the same time as the mage. What followed was an awkward exchange of having to locate each other to attack, with the mage getting off a solid icy blast on both of us. We still wanted to keep the Fog Cloud up at this point due to the escaping stone giant – we did not want him to start pelting us with rocks again! Both sorcerers pumped themselves up – Korinn with Haste and Bryseis with a T-Rex polymorph, and strode into the Fog Cloud to join the chaos. T.I.M. channeled his Healing divinity to bring himself back from the brink of death. The planning phase and battle took a very long time – too long for a single session. We ended it with only one giant down, but I think we turned the tides slightly in our favor. 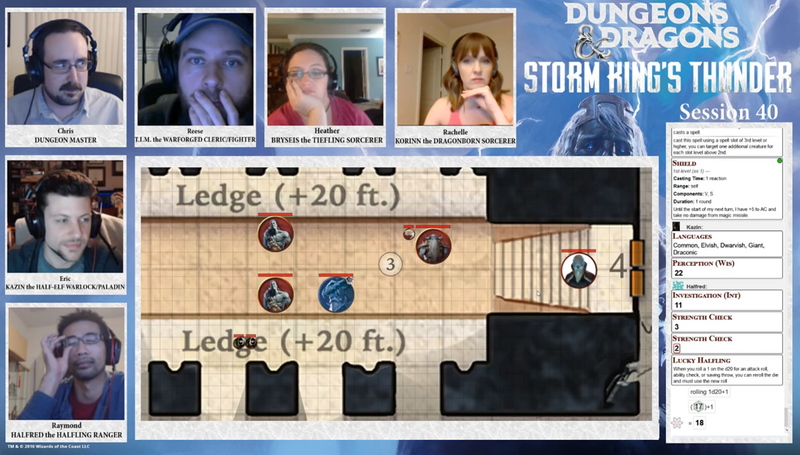 I love that we actually formed a solid plan and effectively executed it, but this is a hell of a fight for the opening room of a dungeon!